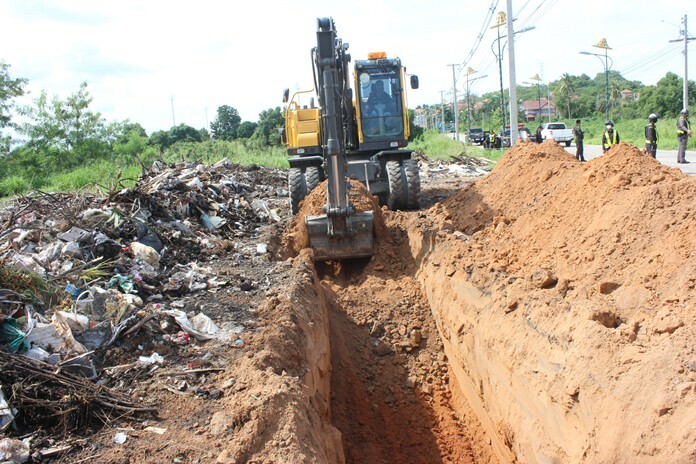 An officially hired backhoe digs a large hole to bury on site garbage dumped along a stretch of Pattanakarn Road. A stretch of Pattanakarn Road was turned into a makeshift garbage dump and residents are none too pleased. The pile of rubbish near the Tungklom Tanman intersection emerged over several nights when an unknown party dumped plastic bags, old, big foam boxes, wooden scrap and vegetable waste along the roadway. Residents complained to Nongprue Sub-district Sept. 19, saying that the trash is a smelly eyesore, especially since the local government just spent millions of baht repaving the road and installing new lights. Officials responded by sending out a backhoe to dig a large hole and bury all the garbage on site. Next articleWhy go to Thailand?